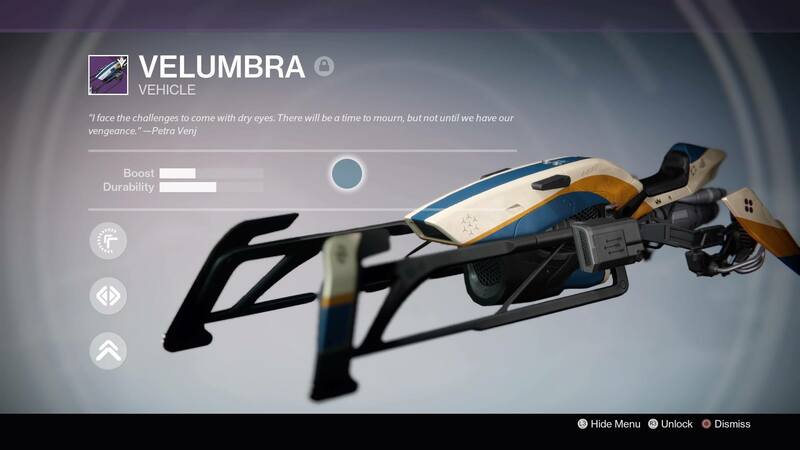 Destiny’s new sparrow, the Velumbra, is easy to get. Here’s how. First of all, complete the new quest line given to you by the April Update. Go see Variks in the Reef and you’ll be given a step called Pretender to the Throne. This is just a short mission, another step in which you kill Taken, and then the completion of Blighted Chalice, the new strike. On returning to Variks you’ll be given the Dreadfang Taken sword at 320 damage. Now go over to Petra and receive a new quest step. Go to the Court of Oryx on the Dreadnaught. All you have to do to complete the quest is kill six bosses in the Court. Just use up your stock of Reciprocal Runes. Return to Petra. She’ll give you the Velumbra. 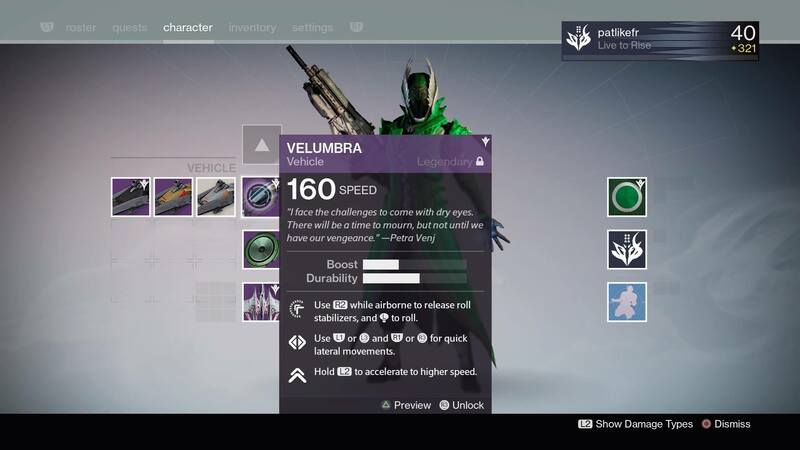 What is the Velumbra and what can it do? The Velumbra is a PlayStation-exclusive sparrow bike, so you won’t be able to get this if you’re playing on Xbox. Stats-wise, it’s comparable to the other legendary sparrows in Destiny, but the Velumbra comes with some cool stunt controls. If you hold R2 while airborne you can roll to the left and right with the left stick. You can also dart to the left and right with L1 or L3 and R1 or R3. Finally, you can hold down L2 as well as R2 for a speed boost. Some of the other sparrows have a risk of exploding if you do this, but that doesn’t seem to be the case with the Velumbra, such is its majesty. The Velumbra also makes a pretty cool noise when you’re whizzing along. For this alone it’s worth completing the quest to get it.